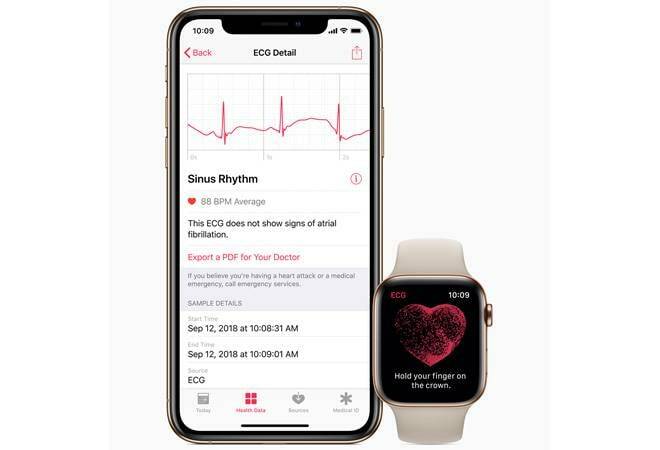 The much-awaited feature of the Apple Watch Series 4, the ECG app and irregular heart rhythm notification, has finally landed with the watchOS 5.1.2 update. However, the ECG app is only available to Apple Watch Series 4 users in the US and its territories and not anywhere else in the world. Apple requires regulatory approvals in all the regions before rolling out its ECG app. The Cupertino giant has been particular about restricting the ECG app for the international markets and changing the Apple Watch or iPhone's region does not enable ECG app outside of United States. For the US, Apple has worked with the Food and Drug Administration (FDA) for a number of years to receive De Novo classification for the ECG app and the irregular heart rhythm notification, to make the features available over the counter. Hopefully, the app should also roll out in India in due course of time. New electrodes have been built into the back crystal and Digital Crown on Apple Watch Series 4 that work together with the ECG app to enable customers to take an ECG similar to a single-lead reading. Launching the ECG app on Apple Watch series 4 and touching the Digital Crown completes the circuit and electrical signals across the heart are measured. After 30 seconds, the heart rhythm is classified as either AFib, sinus rhythm or inconclusive. All recordings, their associated classifications and any noted symptoms are stored securely in the Health app on iPhone in form of a PDF, which can be easily shared with the physician. This feature allows users to take an electrocardiogram right from their wrist. The ECG app on the watch can come handy when a user experiences symptom like a rapid or skipped a heartbeat and helping to provide critical data to physicians. Using the optical heart sensor in Apple Watch Series 1 or later, the irregular rhythm notification feature will occasionally check the user's heart rhythm in the background for signs of an irregular heart rhythm that appears to be AFib and alerts the user with a notification if an irregular rhythm is detected on five rhythm checks over a minimum of 65 minutes. "We are confident in the ability of these features to help users have more informed conversations with their physicians," said Sumbul Desai, MD, Apple's vice president of Health. "With the ECG app and irregular rhythm notification feature, customers can now better understand aspects of their heart health in a more meaningful way." Apple did a clinical trial of around 600 participants to accurately classify the ECG app's recording into AFib and sinus rhythm. Apple claims that the Rhythm classification from a gold standard 12-lead ECG by a cardiologist was compared to the rhythm classification of a simultaneously collected ECG from the ECG app. The study found the ECG app on Apple Watch demonstrated 98.3 per cent sensitivity in classifying AFib and 99.6 per cent specificity in classifying sinus rhythm in classifiable recordings. In the study, 87.8 per cent of recordings could be classified by the ECG app. Even the irregular rhythm notification feature was recently studied in the Apple Heart Study with over 400,000 participants.